The officers of North Jakarta Water Resources Sub-dept. and Tanjung Priok Urban Village PPSU are draining a number of water channels around Tanjung Priok Terminal. It aims to anticipate inundation in the rainy season.
" Some channels are full of mud and waste. 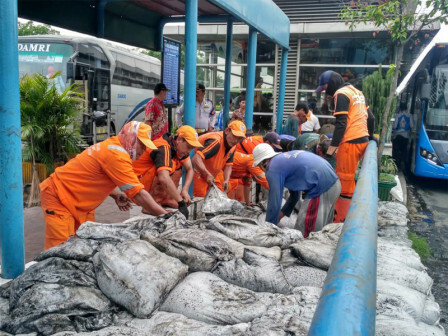 That's why we do cleaning and draining"
Tanjung Priok Urban Village Head, Ma'mun said that the channels cross from Jalan RE Martadinata, Jalan Taman St and Jalan Enggano and empties into Tirem River. "Some channels are full of mud and waste. That's why we do cleaning and draining," he expressed, Thursday (11/8). It has been carried out since three days ago and is targeted to be finished next week. Tanjung Priok Terminal Head, Mulya appreciates the work. "Hopefully it can minimize inundation and improve the comfort of the terminal," he stated.